The Souvenir series are history paintings about the 1960s. They commemorate different aspects of the Civil Rights Movement and Black liberation struggle and pay tribute to the many individuals who were murdered or died during this time. 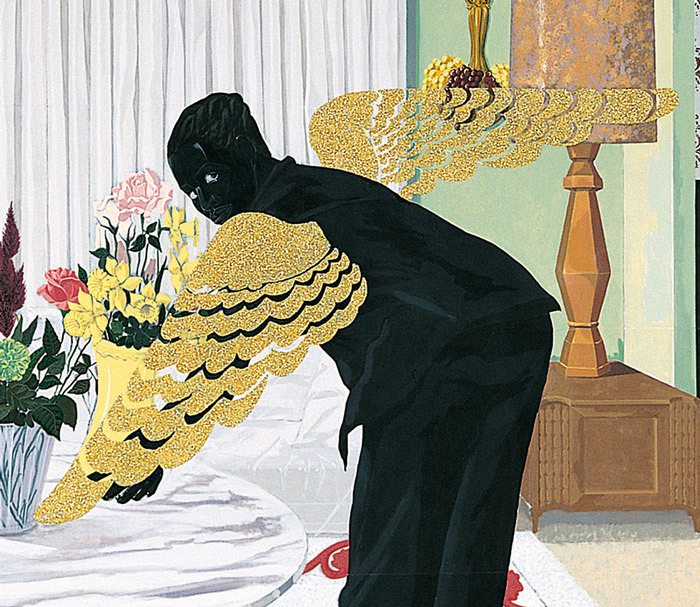 Souvenir I (detail), 1997, Kerry James Marshall. The angelic figures with glittering gold wings in this series are modeled after Marshall’s wife, actress Cheryl Lynn Bruce. History paintings were traditionally made for public spaces, often as a form of memorialization. 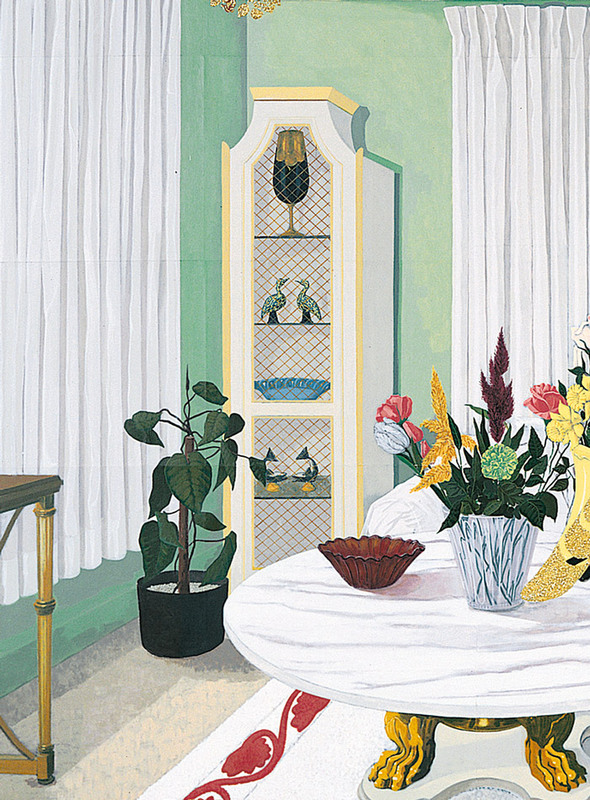 By depicting the personal interiors of his relatives, Kerry James Marshall emphasizes how Black history has been omitted from public commemoration. The individuals commemorated in the Souvenir painting series died between 1959 and 1970. This painting pays tribute to political activists and innocent victims who lost their lives during the Civil Rights Movement. Their faces are adorned with wings like cherubim—or angelic beings—from Baroque painting. "If you don’t understand the capacity of materials to carry meaning. . . . you’re limited in your range to simple expressions rather than complex ideas." This series is on unstretched canvas and hung by grommets. These are similar materials to those used for a processional banner. 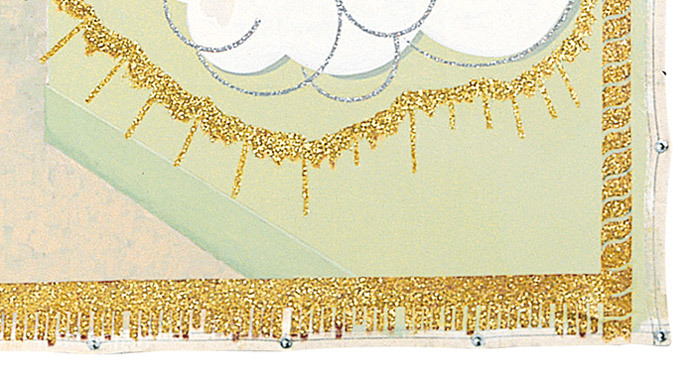 The use of glitter and tassels connects to the look and feel of commemorative cards, as well as the processional regalia of the Catholic Church. 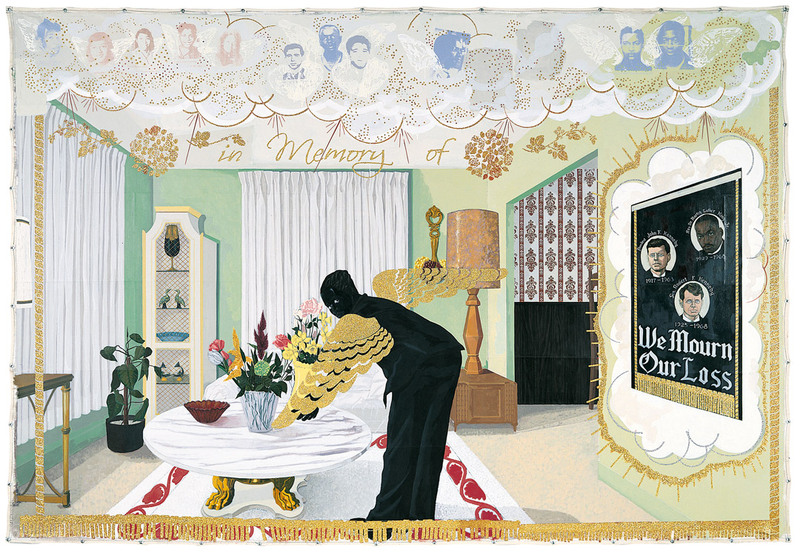 Images: Souvenir I, 1997, Kerry James Marshall, acrylic, collage, and glitter on unstretched canvas, 108 x 157 in., Collection Museum of Contemporary Art Chicago, Bernice and Kenneth Newberger Fund, 1997.73, © MCA Chicago, photo: Joe Ziolkowski. 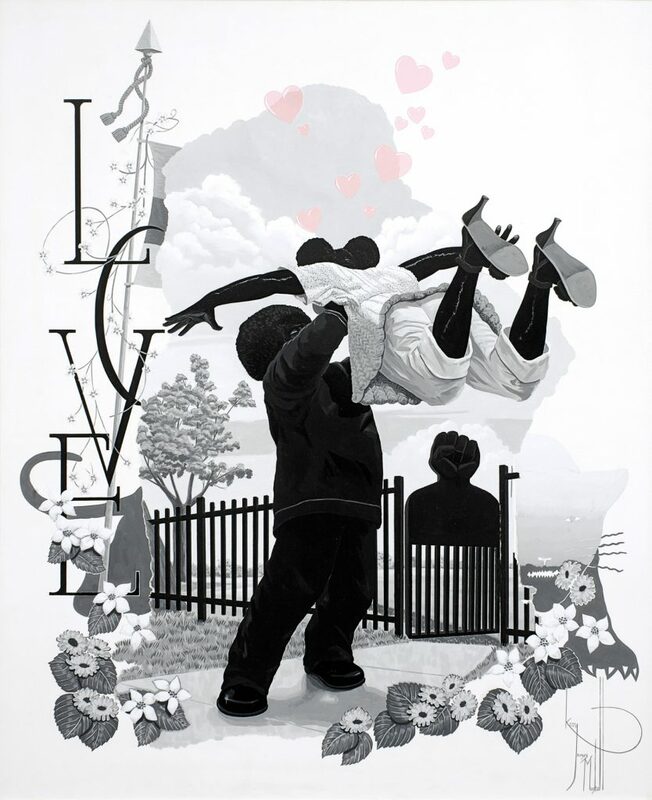 Vignette #2.75, 2008, Kerry James Marshall, acrylic on PVC panel, 73 ¼ x 61 in., The Art Institute of Chicago, Through prior gift of Adeline Yates; Benjamin Argile Memorial, Cyrus Hall McCormick, Alfred and May Tiefenbronner Memorial, Mr. and Mrs. Frank G. Logan Prize, Pauline Palmer Prize, Broadus James Clarke Memorial, Norman Wait Harris Prize, William H. Bartels Prize, Joyce Van Pilsum, Laura T. Magnuson Acquisition, Ann M. Vielehr Prize, and Ada S. Garrett Prize funds; Flora Mayer Witkowsky Award for American Art; Boles C. and Hyacinth G. Drechney and Mr. and Mrs. J.F. Brower Prize funds; The Municipal Art League Prize for Portraiture; Marjorie and Louis Susman, Martin B. Cahn Prize, and Elisabeth Mathews funds, 2008.481.4, © Kerry James Marshall, The Art Institute of Chicago / Art Resource, NY. 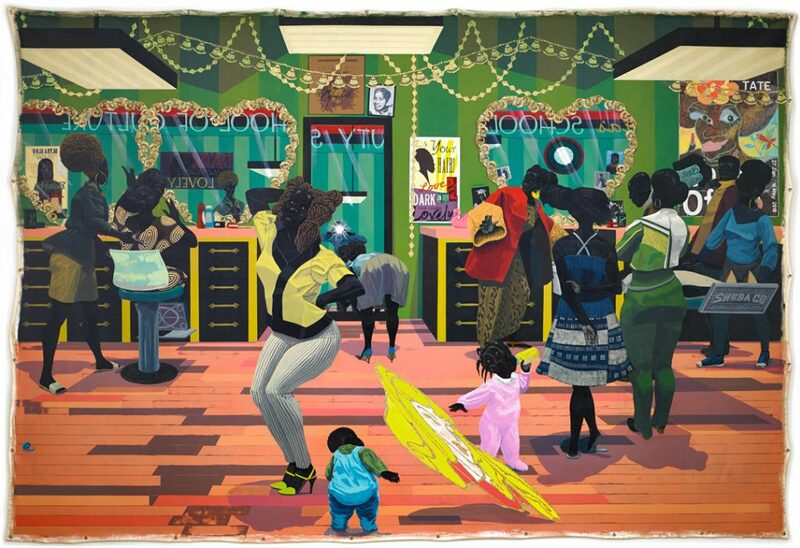 School of Beauty, School of Culture, 2012, Kerry James Marshall, acrylic and glitter on unstretched canvas, 108 x 158 in., Birmingham Museum of Art, Museum purchase with funds provided by Elizabeth (Bibby) Smith, the Collectors Circle for Contemporary Art, Jane Comer, the Sankofa Society, and general acquisition funds, 2012.57, © Kerry James Marshall.